↑ Briggs, M.; Briggs, P. (2006). The Encyclopedia of World Wildlife. Somerset, UK: Parragon Publishing. p. 45. ISBN 978-1-4054-8292-9. ↑ Mendelssohn, H. (1989). Felids in Israel. Cat News 10: 2–4. ↑ 4.0 4.1 Cole, F.R. ; Wilson, D.E. (2015). "Felis margarita (Carnivora: Felidae)" (PDF). Mammalian Species. 47 (924): 63–77. doi:10.1093/mspecies/sev007. ↑ Mattern, M.Y. ; McLennan, D.A. (2000). "Phylogeny and speciation of felids". Cladistics. 16 (2): 232–53. doi:10.1111/j.1096-0031.2000.tb00354.x. ↑ Ognew, S. (1927). 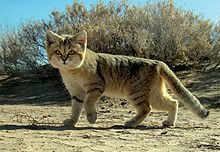 "A new genus and species of cat from the Transcaspian region". Annuaire du Musée Zoologique Académie des Sciences USSR. 27: 356–62. ↑ 10.0 10.1 Pocock, R. I. (1951). Catalogue of the genus Felis. British Museum (Natural History), London, 190 pp. หน้านี้แก้ไขล่าสุดเมื่อวันที่ 11 ตุลาคม 2560 เวลา 14:09 น.